ViaSat, Inc. wanted to end a full day of meetings with a fun team building event on July 30, 2015, so they decided to do a Camaraderie Quest team scavenger hunt. The location of this event was the Legoland Hotel in San Diego, CA, which was a perfect venue for this type of activity. Each of the six teams were given iPads (not to keep!) with clues on them, and the clues asked for a combination of factual information, photos, and videos that the teams had to work together to solve. Once they figured out the clue, they then had to either enter text, take a picture, or film a video on their iPad in order to score points. They were highly encouraged to have fun and be creative, as the more entertaining the pictures and videos were, the more points they received! They also had to think about what strategies work best for their teams based on the personalities in their particular group. Similarly, we can work more efficiently in the workplace if we are aware of how different personalities like to communicate and interact. An understanding of these differences, and similarities, can help companies be more productive. At the end of the event, Los Angeles based instructor Chris McNeany tallied the total number of points, and a winning team was declared. 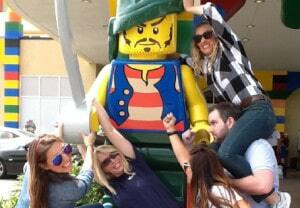 The members of ViaSat had a great time exploring the Legoland Hotel and came up with some truly hilarious photos and videos. Thank you to ViaSat for allowing us to have so much fun with you at this event! For details about Team Building in San Diego, California, click here.